I'm delighted to host another giveaway as a thank you to all my lovely readers! Thanks for all your support and enthusiasm for the Sewing Through the Decades Challenge--I am super excited about it! You may have noticed that I am planning to sew up a pattern (or a couple) from Lauren's Wearing History Reproduction Patterns line as well as Tasia's new pattern from the Sewaholic patterns line. I'm delighted to offer up two patterns in this giveaway: 1) your choice of one of Lauren's Wearing History patterns and 2) Tasia's Pendrell blouse pattern (or a credit for Tasia's next pattern). There are a few more patterns that you can choose from (including, beach trousers, a swimsuit and tap pants!!! ), check out the whole range at the Wearing History etsy shop. 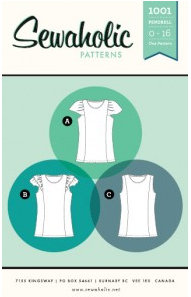 Tasia's currently hosting a sew-along for this blouse pattern (I'm sewing this one up too!) Not to worry if you already have this pattern, if you win and you want you can get a credit for the next Sewaholic pattern. This giveaway is open to everyone. You just need to be a follower of this blog and leave a comment below by Friday the 14th of January stating which pattern you want (or if you want to be put in for both the Wearing History and Sewaholic patterns, just say 'enter me for both'). I'll pick one winner on Friday for each pattern line and it includes the pattern AND shipping to anywhere in the world! I absolutely adore these patterns and looking forward to sharing the talents of these two lovely ladies with you! Happy New Year! Yikes, yikes, yikes, what a great giveaway and how the heck to decide!! After tossing a coin, I would be most grateful if you could consider me for the Smooth Sailing pattern please. Enter me for the Wearing History 1940's sailor girl playsuit, please! Wow, what an amazing giveaway! I have been dying to sew one of the Wearing History patterns but I love the sewaholic blouse too. Please enter my name for both! Congrats on the 300 followers milestone. I'm a new-ish follower and am totally loving your blog. Your sewing projects have really inspired me to finish my old projects and sew more vintage this year. Thanks again! oooooh as a newbie to you I'm rather excited by this could I be entered into the Wearing History one I love the 30s trousers and blouse! Congratulations! I am in awe of your goal to sew through the decades. How sweet to offer such a generous giveaway! I'd love to be entered for the Pendrell blouse. Can't wait to see how everyone's turn out in the sew-a-long. Congratulations!! Please may I be entered for the wearing history 1940s nautical playsuit? Wow, 300 followers, good job! I would love to be entered to win Tasia's Sewaholic blouse, I follow her as well and am loving this sew-along, I just wish I could afford to buy the pattern and join in. Maybe if I win it then I'll be able to take part! Please enter me in to both thank you. Oh, wow. Please enter me for both--and thanks for holding this giveaway! Your blog has been such an inspiration for this vintage loving novice sewist. I love the Wearing History patterns and would love to be entered to win one of them. 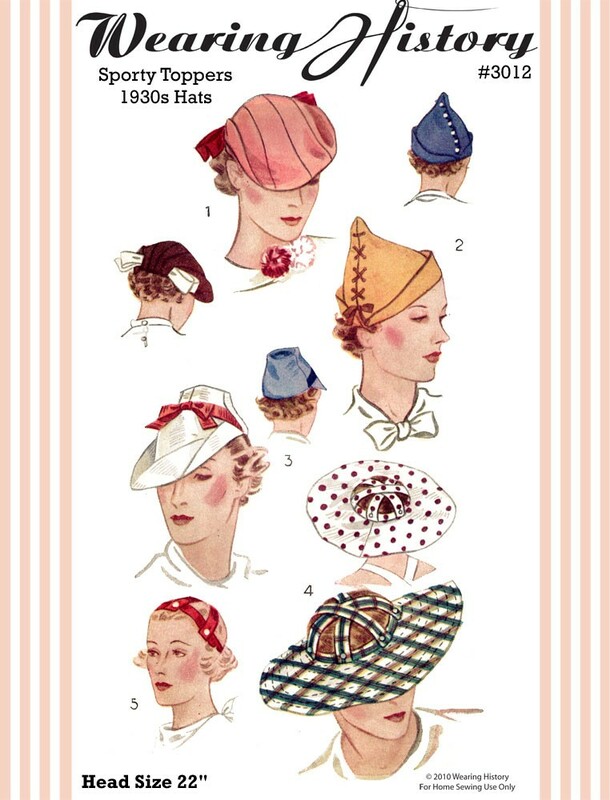 I especially would like to have the Chic Ahoy pattern. Hi! I've been a follower for a little while now and I really enjoy seeing how you interpret vintage aesthetics. Put me in for the WH giveaway please! Oh, yay! I've been admiring Lauren's patterns from afar for awhile. Please enter me for the Wearing History 1940's sailor girl playsuit. Great giveaway! Enter me for both. I love the 1940's sailor girl playsuit - so cute!!! I've so been enjoying your blog : ) Thanks for the giveaway! Oh, fun! A Wearing History pattern would be very exciting. 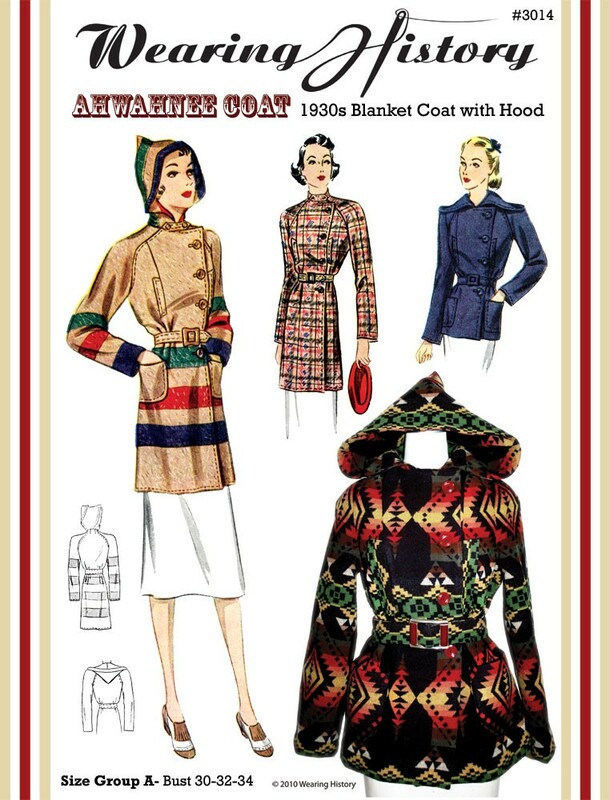 Oooh oooh oooh oooh id LOVE the Brand new 1930's blanket coat pattern, very funky!!!! im taking part in the sewalong too, yipeeeeee cant wait!!! Great giveaway! I would love to win that first sailor girl playsuit in the larger sizes. So fun! I'm so excited to start sewing again. I would love both. I'm interested in sewing my own pair of trousers. That is my project. Oh, golly! We are supposed to choose from this incredible list?? Hmmmm, I'd be happy with a credit for Tasia's new pattern or anything from Wearing History. This is such a wonderful giveaway. Congrats on reaching 300 followers. I would love a chance to win the Wearing History 1930s blanket coat pattern. Oooh, what a lovely ofer! I'd love to enter for a Wearing History pattern please - they're all so lovely and I have quite a few on my 'to sew' list already. I've been following your blog for some time now and I always enjoy your entries. Can't wait to see what you do for the Sewing By Decade stitch along. I'm tossing my hat in for one of Lauren's patterns. What a great giveaway! Love the playsuit from Wearing History so would love to enter for a chance to grab it! O.My.Goodness. Could I please be entered for both? I adore that sailor outfit and the blouse pattern is fabulous!! Thank you, Debi! I've had my eye on the Sailor Playsuit pattern - so cute! Thanks for a fabulous giveaway! I'd love to be entered in both! Please, enter me for a Wearing History pattern! And thanks for such a nice giveaway! No surprise you have so many followers. I love both what you make AND your enthusiasm about sewing vintage. I would love to be entered for both the giveaways, and would choose the smooth sailing pattern in wearing history's. how exciting, enter me for both please :) looking forward to seeing your new creations this year! Great giveaway! I love the sailor girl playsuit pattern, and of course Tasia's blouse pattern is adorable...I'd love to win! Yay, Debi, this a generous one! Congrats on the 300+ already! 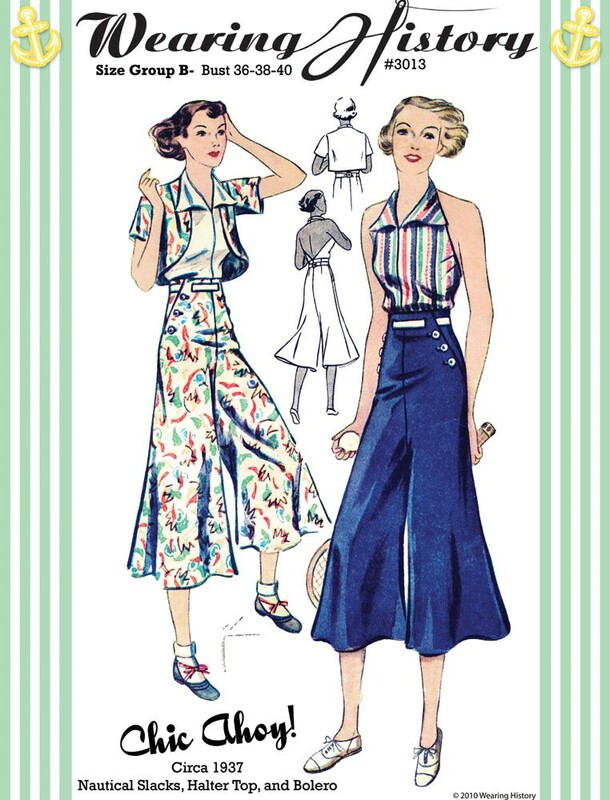 As I'm all for the separates and for months drooling over the "Smooth Sailing--Classic 1930's trousers and blouse" pattern. Enter me please! I love love love the 40s play suit! I'll take that one if I get chosen, thanks! Could I please be entered for both? Thanks Debi! 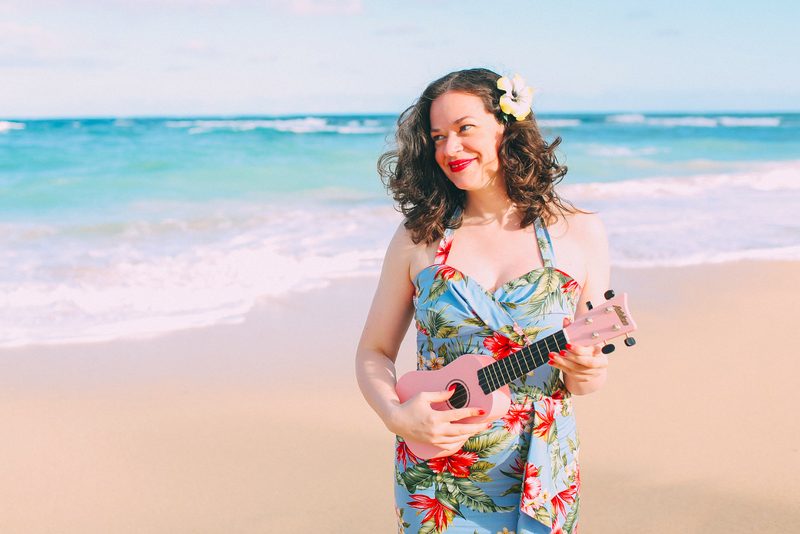 Hi there, so lovely to have found your blog, I'd love to be entered for the wearing history pattern as I've been eyeing up her 40's play suit for a while! Ooooh, I'd love to have a go with the Wearing History high waisted nautical pants! Congratulations on reaching 300! I'm a newbie and very much looking forward to future posts! I love Lauren's patterns! Despite the fact that it still feels like the dead of winter here, I'd love to win Chic Ahoy! and have it all sewn up before summer gets here. Wow, 300 followers. Go you! I'd like to be put in for both patterns please. I rather fancy the Pendrell blouse. I've been thinking of getting one. Hi Debi, Congratulations on reaching 300! You deserve it! You are truly an inspiration. Looking forward to watching yours and Sarah's, and everyone else's, progress through the decades! I have rather given up on sew a longs as I just can't keep up! Need to make myself a few blouses though! Add to me to the both list! Wearing History does have some fantastic patterns. I think the 30's sports togs is my choice. 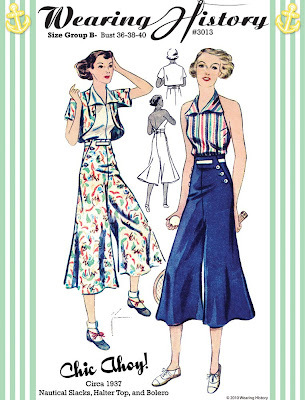 I have had wide leg pants and vintage shorts on the brain as of late! Congratulations on 300! I would love to be entered into both giveaways. I love the new 1930's coat pattern from Wearing History best! Congratulations Debi, I can only imagine what 300 followers must feel like!!! Please may I enter for a Wearing History pattern? IF I win, can I decide which one then...I'm finding it hard to chose a favourite just now! I found this blog from the Wearing History page. I love that you're concentrating on 1939-41! I love that period. And with all your pictures in Scotland, it reminds of the photos of my grandparents just before the war... only in colour. How fabulous to find you. Enter me for both please!!! I love that play suit and the "Chic Ahoy" outfit. So so very cute! Even more than participating in the giveaway I want to say congratulations on 300 followers! It's always a pleasure to check in an see you're projects. But since there is a giveaway, please toss my name in for a Wearing History pattern. I would love to be entered into both comps please, but I do love the salior playsuit, it is awesome!! wonderful giveaway! If I'm going to attempt to "sew through the decades" I think I'd like to be in the running for a Wearing History pattern. Crazy Cat Lady, needs to have that playsuit. It is just beautiful, but the pendrell blouse, how to choose they are all fantastic. I would be thankful if you would be able to enter me into both. Such a lovely giveaway and I really adore the patterns, both of the choices. So I would like you to enter me for both. I think I need that Sailor Girl playsuit! Enter me for the Wearing History pattern, please. Wearing History please.I am soooo desperate for any kind of thirties patterns and she has some lovely multi size,multiple garment patterns. Congrats!! Enter me for both please! I've had my eye on "Chic Ahoy" for a while- please enter me for that. Thanks!! 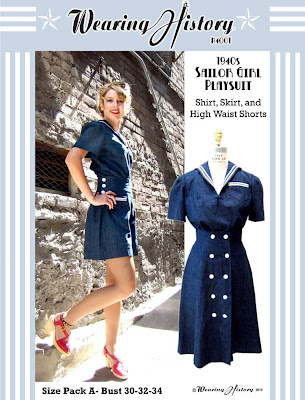 Count me in for the 1940s sailor girl playsuit, from wearing History! I've loved it ever since the first time I saw it! Wow, what a busy time on your blog right now! 300 followers, a new (awesome!) challenge and a give-away to boot?!?!? Enter me for both patterns please I'd love either! Hello ! I'm crossing over from Wearing History. I can't wait to catch up over here and read up. Enter me for the Wearing History please! Woo! Enter me for both please :) I have been eyeing Lauren's for awhile and love the blouse too! I'm so happy to have found your blog (via Lauren) and become a follower! I can't wait to see the results of your sewing! I lovelove the Wearing History patterns, so please enter me for that giveaway! Hi! I just found your blog via Lauren. It's great. I'm sorry I never found it before. =] I'd love to be entered for one of the Wearing History patterns. I just love them! How can anyone bear to part with any of these patterns. Count me in for wearing history please. Congrats on 300 followers, that is fantastic! Please put me down for both patterns, I'd love to win either! What an amazing giveaway! I'd love if you'd enter me for both! yay! Congratulations on your 300 followers! I'm sure there are many more to come! Wonderful idea for a giveaway! If I win the sailor girl playsuit pattern, I promise to show the results on my blog! Please enter me for both, thanks for holding this giveaway and congratulations on hitting 300. I think I need the blanket coat pattern, I am after all Canadian! Wow! Lovely patterns. I love the sailor girl playsuit! Awesome giveaway! Congratulations on 300 followers! Can you please enter me for the Wearing History giveaway? Thanks! What the easiest pattern to do actual Laurens Chic Ahoy pattern looks about my skill level. Congratulations on the number 300. Having a major blog catchup - and congratulations! Would love to enter the Wearing History part of the give away. I've been meaning to order smooth sailing pattern and if I don't win I'll order it anyway! Oh wow, congratulations Debi! And what a generous giveaway! I'd love the Chic Ahoy Wearing History pattern (actually, I'd love them all) but that one has been calling to me ever since I saw Lauren's pictures of the finished article in yellow on her Etsy shop. Sign me up for the Wearing History Smooth Sailing pattern, I love it and have been meaning to order it. I found your blog through Wearing History and I'm so glad I did! I've been enjoying reading and drooling over all the patterns but I have to say the 40s Sailor Girl Playsuit is my fave!!! Love it and thank you for the chance to win it! Hooray for giveaways! Somehow I missed the Sewing Through the Decades post, so I shall have to go investigate that. ;) Please enter me for the Wearing History giveway, as I already bought the Pendrell blouse recently. Thank you so much for hosting this and congrats on the 300 followers! I'd love to be entered in both giveways! 1940 sailor girl playsuit preferably, or the smooth sailing one. Great blog, and congradulaions! what an amazing giveaway!! I love the trousers and blouse pattern from Wearing History! How neat! I've been thinking seriously about making a playsuit and would love that pattern! Great giveaway! Please enter me for both. Thanks for the chance to win! For some reason when I kept looking at your blog, it just kept showing your moving boxes!! (dam computers) I was worried you'd got lost in the snow. It's great to see you're settling into your new flat, you have a great view from your sewing room. Please enter me for both, I love Laurens Sailor playsuit. Best regards for the sewing year ahead. Chic Ahoy! Super cute 1930's outfit for ME! Love it. Or the lovely top, I could always do something with that. Congratulations! I love the smooth sailing trousers and blouse -- Please enter me! Thanks for the great giveaway...Please enter me for the Wearing History Sailor Girl Playsuit. I'm keeping my fingers crossed for the sailor girl playsuit. All of the patterns are divine! I'd love to be in for both. Love the sailor girl playsuit. Please could you enter me for the Pendrell blouse? Thanks for such a generous giveaway and well done on all your followers. I've just found your blog - great things! Please enter me for both - they are just gorgeous! Such a great giveaway! I'd love to have any of Lauren's patterns. I haven't had the chance to use one yet. I'd especially like the sailor girl outfit. I've been eyeballing that for a long time. Although the hats and Chic Ahoy are pretty darn cute too! Ditto to Jenny's comment! Please enter me for the 1940s Sailor Playsuit - I love it! Wearing History...I love her patterns! Thanks for the chance to win one to make for myself :). Hello! I would like to enter myself for the 1940's sailor girl playsuit. Thanks! Wow, I am so excited about this give away. 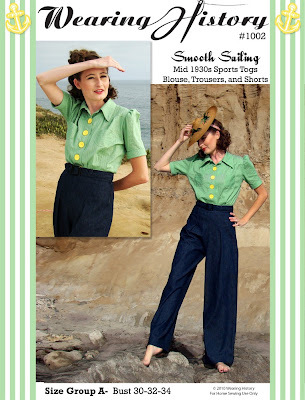 I love the, Smooth Sailing--Classic 1930's trousers and blouse. The patterns are so wonderful. I just got introduced to your blog from The Sew Weekly. I really like your blog. There are only a hangful (about 8) that I follow religiously and yours is one of them. You inspire me to sew and encourage me because you make it all look so do-able. 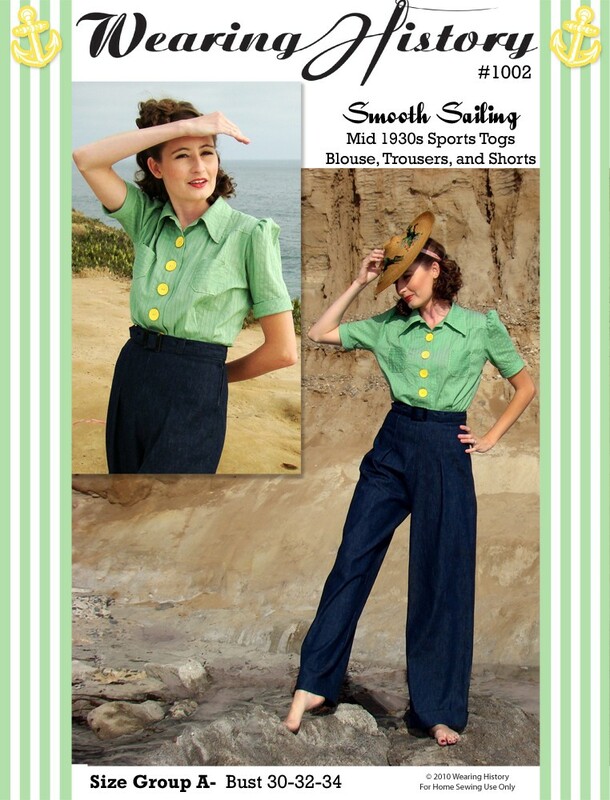 I would love the Smooth Sailing--Classic 1930's trousers and blouse because they look like good basics to have in the wardrobe. Congratulations on having all those followers. Please enter me for both options - I really like the blanket coat! So happy I found your blog through Wearing History. I would love to win the Smooth Sailing pattern please! What a fantastic giveaway--I'd love the sailor girl playsuit! I just found your lovely blog. I would be delighted to win either, please enter me for both! I'd love to have either. They are both lovely. I really love the hats.